We are a a few days past the mid-way point in 2017. Time flies eh? Only a matter of months ago, I was finishing off the turkey and badly singing Christmas carols. Badly. I like to take stock of the previous few months once in a while and 2017 (so far) has been one to remember. For good and bad reasons. I started off the year with my hand in a cast. I won’t get into how that happened as I’ve gone through that many times in previous posts. I also discovered the Camino Prep Training group on MeetUp.com and that has grown from strength to strength. I have moved from a position where I had very little to do during the weekends to being pretty busy most Saturdays or Sundays. This is a good thing but that may change soon. I also spent a month in hospital, which seemed like a lifetime, but it also seems like a lifetime ago. That was March, everyone was wearing green and it rained alot. I was in a good place but I needed to get back walking once I returned to normality. On a positive note, I received the keys to my new apartment in April. Excitement kicked in and to this day, I am in the process of decoration. There is a lot to do and there is not alot of time to do it. I hope to be fully moved in before the end of August. 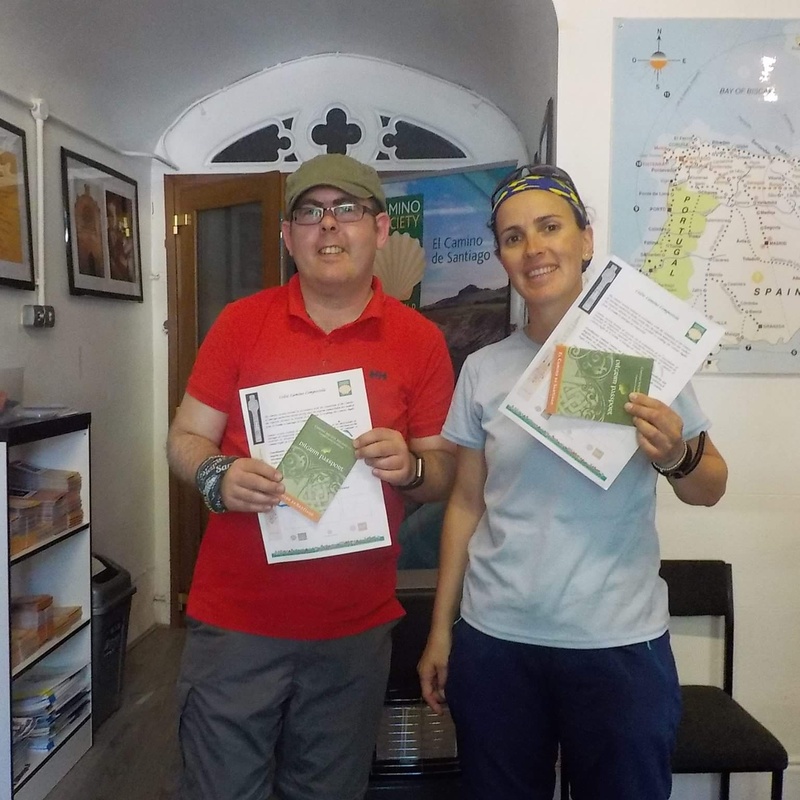 June saw me lend my humble hand to Camino Society Ireland and their Information Centre. Where else can I talk for half a day to future pilgrims about the many ways in Spain? It’s ideal! I’m a peregrino who doesn’t switch off and I look forward to each day I volunteer there. June also saw me walk the Irish stage of the new Celtic Camino from Bray to St. James Church in Dublin. I will be given a certificate and will present this at the pilgrim’s office when I complete my walk from A Coruna. I will receive a compostela then. This is a great new initiative and let’s hope it takes off. It is now just under 2 months before I walk from Burgos. The meseta is such a vast expansive place and I have always enjoyed walking through it. That said, this “may” be my final time on the Camino Frances for a while as I consider other routes. But I don’t write the future, so who knows! So that is where I am this year, a lot has happened but the next few months are important too as I focus on a new casa. I may have to lay down my backpack for next year to concentrate on that but a short Celtic Camino is still on the cards. Early Friday morning I received a text from my friend Oihana asking if I was free to take a walk the following day. I said I did and the starting point was to be Bray in Wicklow. Bray is roughly an hour on the train from my home and about 30 km walk to Dublin city centre. The plan was to walk for 15 km or so and then we could catch the train or bus home. However I brought up the suggestion that we could walk to St. James Church and complete the first stage of the Celtic Camino. We were to bring our pilgrim passports and collect sellos just in the event that we do make it to the end point. I felt in good shape so there was no reason not to. If we made it and collected our certificates, we would then be entitled to a Compostela having walked from A Coruna, something I have been planning to do in March or April of 2018. We met on the train in Dublin city centre and continued on our way to Bray, which is a large seaside town in Wicklow. It has a large promenade and a great cliff walk that I have yet to try. We arrived close to 9am and looked for somewhere to receive our first sello. We were told by one of the staff that the information desk at Bray train station would provide us with one. We were delighted however we had much amusement changing the date on the stamp! We had proof that we were in Bray and we took a selfie just in case the powers that be had any doubts! Onwards we went and walked northwards in the direction of Shankill, a large residential estate and town. It was a shame we moved away from the sea and I hope in time, it will be possible to walk closer to the coast in that direction. It took close to an hour to pass Shankill and we were delighted to meet a large church called Crinken Church. We hoped that it would be open and it was!! A music group were practising inside and welcomed us in. One had walked the Camino before and was delighted to hear of this new Camino. We asked if they had a sello and after much hesitation, he said he would look. He returned with a stamp of two footprints..very symbolic! We later learned that the name of the church is St. James’ of Shankill..win! We both felt good and with plenty of water we felt that we could complete the 30km. It was still early however the temperature was increasing. It was predicted to reach 27c in the afternoon and at 10.30, it was in the early 20’s, so we tried to stay in the shade as much as we could. Before leaving Shankill, we received another stamp at the Post Office. They were delighted also to hear of the new route and said that they were planning on walking in Spain soon. We also saw a man wearing a t-shirt with a large yellow arrow. 🙂 That could only mean one thing…he has been on the Camino! We wished him a Buen Camino and walked on! From Shankill, our next stop was Killiney and we were back on the coast again!! The seaside breeze felt great. With the sun out for the day, dozens of people were making for the beach and the walkways were crowded with folks out for the day. I decided to take a little detour and walk through Killiney Hill. That means jumping up about 100 steps to reach the top of the Hill and the famous Obelisk statue. Phew..what a climb. And it was a perfect time to stop for a rest and to marvel at Dublin bay from a height. I could see where we both started and also where we both had hoped to finish. It is one of the highest places in Dublin and great for a walk. Killiney Hill is a large park and is very animal friendly. Plenty of dogs were out with their owners lapping up the sun. Adelante!! We left the park after that much needed rest, and rather than continue by the coast, we walked on a trail called The Metals straight to Dun Laoghaire. The Metals is a 3km straight walkway that was formerly a rail line from the quarry in Dalkey to Dun Laoghaire. It’s a lovely walk way but there are no opportunities to collect sellos. We might collect one or two in Dun Laoghaire, we hoped. And we did, as the local library was open. They were glad to assist. Dun Laoghaire was bustling. It’s amazing what the sun can do. We continued on but not before we took the below pictures. From here we would walk along the coast until we reached Dublin Port and 3 Arena. It seemed like the entire population of Dublin were out by the beach, even though the tide was out! With time passing, I became more aware of a niggling pain in my foot but a 99er ice cream seemed to ease the pain for a while. We reached Dublin Port at 2.30pm, a full 5 and a half hours since we started. It was by far the best walk in Dublin I have taken, made special by the great company and the people we met along the way. From Dublin Port, it was a straight walk along the quays up to St. James’ Church which closes at 3.30 on Saturdays. I had slight doubts that we weren’t going to make it but Oihana is super-positive and assured me that we had all the time in the world. I was introduced to the Jeannie Johnson ship that is based along the port and EPIC, the Irish emigration musuem. Where have I been all these years??! Along the quays we walked until we came to Christchurch Cathedral and Vicar Street. Then the Guinness Storehouse and St. James’ Church. We arrived at the Camino Information Centre at 3.15pm and showed our credencials. Yes, I had sore feet, yes I had a farmers’ tan, but boy! what a walk?! If you are interested in walking the Celtic Camino, this is a great route for your Irish leg. Alternatively, you can walk a pilgrim path, for example St Kevin’s Way or St. Declan’s Way. But for somewhere closer to home, this is ideal. If you are unable to walk it in one day, you can walk it over two days. You will be still entitled to a certificate from the Camino Society. So 5 out of 5! Now to look forward to A Coruna in 2018. It is May 1st – “Lá Bealtaine” in Irish. May Day officially heralds the beginning of the summer and the powers that be have granted us a day off from work. Gracias a ellos! “Lá Bealtaine” derives from the Old Irish words “Bel taine” meaning ‘bright fire’. Many people say summer doesn’t start until June but the good weather has kicked off here in earnest with temperatures in the high teens for the remainder of the week. It will be hotter than Ibiza, I have heard! I also have the Camino Celta very much on my mind of late. I hope to walk St. Kevin’s Way in Wicklow before the summer is out. This pilgrim path will serve as the Irish leg of the Celtic Camino. The remainder will start in A Coruna and end, of course, in Santiago. I will be entitled to a compostela at that stage. There is plenty of time for the Spanish leg however – I have 2019 in mind. Another beautiful day and another trip with the Camino prep meet-up group. Each time I meet with them, I feel like I have stumbled across a pot of gold. Yesterday, we took on the Spinc trail at Glendalough. As some of you may know, Glendalough is home of St. Kevin’s church and monastic site. The Wicklow Way also passes through this area. We arrived at 10am and started on a short walk to the trail head. At that point, we were greeted with a long and steep climb. It wasn’t all doom and gloom though as there were steps to aid us..near on 650 of them! It wasn’t long before the calves began to give in! After a half hour, we reached the top and were met with a fantastic view above the upper lake and Glenealo river. After a quick breather, we marched on, taking advantage of the boardwalks. A short time later, we reached the top of the Spinc. Boy, was that tough! But for all the aches and pains, we were rewarded ten-fold with amazing views. Looking down over the cliff-face, you can see the path on the other side of the lake. We would be walking this in a few hours. The trails were full while we walked as many took advantage of the Easter season and took in a hike. There were many tourists out also. I was really impressed to see children of all ages run up the ascent with no bother! A further hour passed and after a descent (in some parts dangerous) we reached the old Lead-mine ruins. We all stopped here for lunch and a breather. We weren’t far from the end, with another 4 km on the flat left. On arriving back to base, we grabbed a coffee and a snack in the Glendalough hotel. I was really happy with the day and having no rain was a bonus! The next few weeks’ walks will keep me busy as I have the Howth Bog of Frogs planned with the Camino Society of Ireland on Saturday, followed by the same on Sunday with the Camino Prep Meet-Up group. The next Saturday (29th April) we have decided to walk from Hazelhatch to Sallins along the Grand Canal Way. Let’s hope it is fine that day too. Last weekend I took a trip westward to meet my good friends C and J. I have written a number of times about them after we met in 2013 outside a wet and windy Santo Domingo de la Calzada. Whenever we can we all meet up to reminisce, have a few cervezas and of course, talk about our respective future Caminos. So after a pilgrim meal and a few cervezas on Friday night, we woke up bright and early and headed off to our starting point. I brought a full pack and my Pacerpoles in the attempt to make this walk as realistic as possible. I had a Helly Hansen rain jacket as I am eager to leave my Altus at home. So I was wishing for a little bit of rain to test it out. On arriving at the start point outside the village of Doon in Limerick, the clouds were grey and full so I was optimistic! We set out just before 9am and immediately started to climb. The legs started to pain me before I reached the top. I thought to myself “Hmm, I am nowhere near Camino-fit”. But these types of walks are ideal if I am to conquer the Leon hills and O Cebreiro again. The majority of the walk was along back roads close to the villages of Hollyford and Lackcomer in Tipperary, and Doon in Limerick. The trail followed the River Multeen for most of the day so it was great to have the sound of running water beside us at all times. In fact, there is a waymarked trail called the Multeen Way, which is part of the Ireland Way, but we decided not to follow it and we went about our own way. We had great craic talking about past Caminos and our plans for the next. C & J are walking from St Jean to Santiago in September just after I return from my 2 weeks. So I will be vicariously walking with them. My Pacerpoles were fantastic. It took me a while to get used to them and how to use them right, but once I did, I had a much quicker stride and there were no pains in the legs. I had no problems with the Osprey pack either. C told me she always gets by with a 28 litre pack, much to my surprise!! Our day ended with a huge hill to climb; a little like the climb to Alto del Perdon! I powered ahead in the hope of reaching the top quicker. At this stage, we were in the clouds and, in fact, close to a wind-power plant. Alto del Perdon is definitely right!! We finished off with a nice descent back to the car and short drive back to base. Whenever I am in the Limerick area, I do my best to visit Glenstal Abbey to go to Vespers. I couldn’t pass the chance again. I have been to Vespers twice in Rabanal del Camino and have been in love with their sound and harmonies since that first time in 2012. I arrived back to base close to 10pm when we watched a number of Camino related videos from YouTube.